…but the Chiefs didn’t go down lightly. 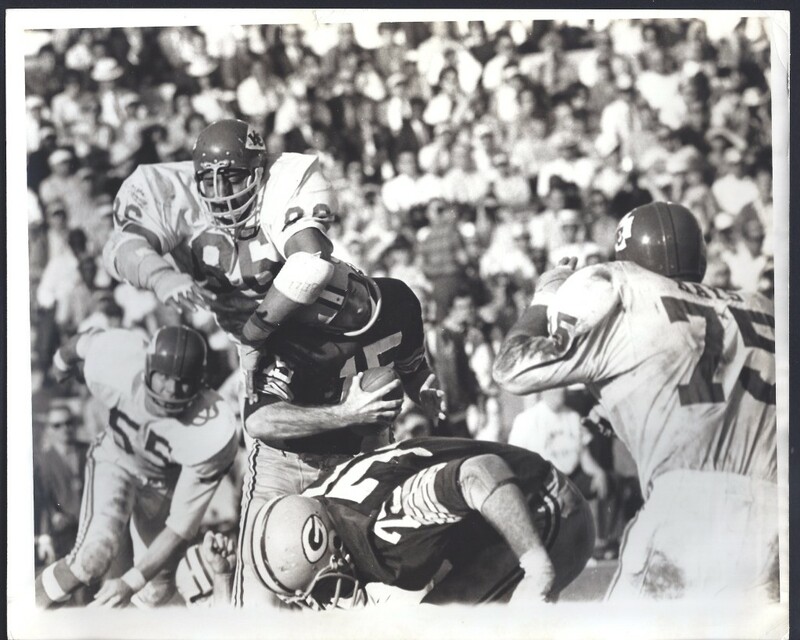 Here Buck Buchanan puts a walloping on the Packers’ Bart Starr, while Jerry Mays closes in from the other side. Just one of several Super Bowl I & III images that have been recently come available due to the selling off of old newspaper archives. Will say it till I die… Superbowl I was ‘not’ a rout. The younger Chiefs had the horses to beat the veteran Packers, alas not the experience/moreso perhaps ‘presence’ upon the national stage; the GB mystique much as anything prevailed; execution too, of my Chiefs in the process. Game was essentially a 14-10 tossup at halftime, and KC having out-gained GB in yardage; the Chiefs had also missed a field goal and in the process a 10-7 lead over the Packers at one time in the game. Mike Mercer was the KC kicker, and he was the best in the AFL in 1966, a better field goal % and more field goal’s to boot than Gino Cappalletti, latter who (due name recognition, one supposes) won the popularity vote & All Star game nomination instead of Mercer, who wasn’t in that game. Yes, this is the “woulda, coulda, shoulda, if’s, but’s & mighta beens” can be trotted out by any team, player or fan… a loser’s lament if you will. Still, Chiefs fan that I was and having attended this game, wasn’t convinced that GB had anything on the Chiefs from a talent standpoint, though the scoreboard is as always the final arbiter. I remain convinced however that the Packers were and remain pro football’s greatest ‘team(s)’ ever. Convoluted logic or just my KC pride kicking in, if they played each other X number of times, Chiefs would have won their fair share, my guess… I’m not alone in that sentiment. Some players like Mike Garrett (“I was in awe of the Packers”) wondered why the Chiefs hadn’t played better after it was done & looked forward to “playing them again” – which of course never happened. Years later some like Otis Taylor in his book “The Need To Win” felt the Chiefs “quit” after their only turnover of the game, Len Dawson’s interception. Taylor felt Lenny went into denial about how much better GB was, according the book. On the other hand, Chris Burford (who posts often here on TFTAFL) was quoted as saying “we’d seen the films and we had as much team speed or more than they had in my mind – size wise and everything else. They just had the big reputation.” Chris has also stated on TFTAFL the Chiefs had other plays offensively they did not use (but had practiced) in the game for whatever reason, only the late Hank Stram perhaps knowing the reason. Of course, Fred Williamson (‘The Hammer’) had something to say, as always, and he has been made out as a scapegoat of sorts by many, including myself; I have never been a fan of mouthy-types on my team or any. Suffice to say, Williamson left no doubt as to how he felt, beforehand (from Taylor’s “The Need To Win” – “I haven’t seen anything in the films that offers much of a threat to me”, and “h*ll, we shouldn’t be happy just to be playing in the same game with them, we should be concerned with beating their sorry a**es”. 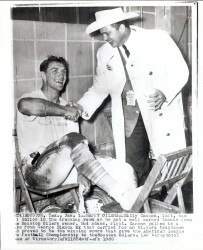 Too, before the 1967 Superbowl, Chiefs Coach Hank Stram had said (according to one newspaper report) “we’ll tear the Packers/NFL apart!” This was denied, but, whether it was uttered or not, I can imagine that, in the thrill of the locker room after KC had beaten BUFF 31-7 for the AFL Title, such a statement might’ve been stated, by anyone in fact associated with the Chiefs. Will say this – never since has a Superbowl had the build-up that the first one did. From players, fans, networks, scribes – even those folks not familiar with the game who were queried for a prediction – it was as one magazine then called it – “the time of the hard sell!” I still have my copies of the KC Star & Times newspapers from that day & the days immediately before & after the game and the reference to deserted streets in KC was a scenario I’m certain was copied in GB and elsewhere across the land that January 15th day in 1967. C’mon, get over it, I hate the Packers but the Chiefs were over matched. AFL bias is showing. You’ll just have to hate GB a little more then appears… having heard your plea, say with all due respect you haven’t a clue what you speak of Tex- er ‘John’. Try harder to control yourself, for, cannot control anyone else nor their expressed sentiments. Which I’m going to offer some more of right now, so cover your eyes, ears and sensibilities if you please. Reiterate, GB didn’t lead 35-10 from the start SB I – they were in trouble at halftime, by their own admission players, coaches & Lombardi who was not pleased. Gambling line aside, predictions by NFL types for a 60-0 win were quickly dashed by the AFL Chiefs. Unfortunate you are unable see things as they actually ere, but that is your prerogative/problem. Superbowl I was no more a rout than was Superbowl II, III or IV – none of them were routs, all could have just as easily went the other way, victor. GB held but a meager lead SB II, until an unforced OAK error (a fumbled punt) just before halftime gave GB some breathing room. Even the Packers Willie Davis said as much, post game. Experience again (OAK even younger than was KC the year before) the difference the game. I for one never got the feeling SB III that the Jets had the Colts number – BALT merely made too many errors – including unforced ones – prevented them from prevailing, instead suffered a curious if not dominating defeat. As I have said before, SB III was the one that least impressed me as an AFL fan / adherent, though it is the triumph that the AFL hangs it’s helmet on. SB IV, 23-7 is no more convincing than was 16-7 final SB III. MINN scored a td early 3rd quarter & it was but 16-7 KC; same case as Superbowl I, hardly a decisive lead by the eventual winner. KC’s ‘experience’ gleaned SB I was no doubt of benefit, Vikings the nascent faction this SB. Being an NFL guy, I was a bit worried that the Packers didn’t dominate in the first half. I thought Kansas City more than held their own. At halftime, it was said that Lombardi said if the team didn’t step up their game they would lose. Dawson threw a pass early in the third quarter that he wished he could get back. The return to the five yard line and quick TD were too much for a team that didn’t quite know where they stood in comparison to the Packers. In fairness to the Chiefs, they were not the first nor last team to play even with Green Bay in the first half and then get beaten in the second half. Today’s Patriots are very similar. They step on the gas in the second half and beat the pretenders. I think the Chiefs talent was as good as Green Bay, but, they were not quite as poised. I think the 1967 Raiders were also a good team that couldn’t keep up in the second half with Green Bay. But, they were not alone. The Lombardi Packers were a team for the ages. I seem to remember an earlier post by Todd where it was determined that the 1966 Chiefs were not in the top tier of all time AFL teams. The Chiefs entered the game banged up with DT Lothamer out with a shoulder and center Jon Gilliam suited up but not playing because of his knee injury. TE Arbanas separated a shoulder in the AFC title game yet played and DE Chuck Hurston played but was ill. Much like the Jets in SB111, the Packers had success running left. I remember the missed Mercer FG and the excellent Chief kickoff return that was nullified by the TV glitch. Much like SBII, a few plays impacted the direction of the game. I’m sure Tex Maule expected a 50 point win by the Packers. It was a rout!! I was there as a thirteen year old. We paid ten bucks to see it! (can you imagine) Lombardi’s teams felt you out in the first half, then lowered the boom in the second half.. Once the Packers figured out Strams moving pocket and that play action that Dawson liked to use, it was all downhill for the chiefs.. Tom Brookshier tried all week to get Lombardi to commit that the NFL was a better league than the AFL. Finally, after the victory, Lombardi said that he felt the Chiefs were not as good as some of the mediocre teams in the NFL. Lombardi always knew what to say, but two years later, he would eat his words as Joe Namath beat the Colts in Super Bowl 3, a Colt team that I thought was better than the two Packer Super Bowl teams. Add to the fact that Stram would get his revenge and beat Joe Kapp and the favored Vikings, not to mention Miami and Pittsburgh’s wins for the AFC…When I visit Lombardi’s grave here in NJ, I always remind him of that!! lol. Actually Lombardi thought New York would win. He thought they would be able to beat the Colts blitzing (which they did). Can’t disagree with anything that either Howard or billd said. A couple other things: ‘conditioning’ was raised as a possible aspect too, GB’s win. Recall reading some GB players alluding KC had “fat guys” & they wore down as the game wore on the warm sun shine in LA, inference GB was in better shape. Too, Chiefs ending up in California nigh on a full two weeks before the game was played may have been a bad thing in hindsight, according to Stram/others, ‘distraction’ the gist along with too much media exposure which raised stress for the players. Packers (if I recall correctly) went out to California only a week and not two before the game, even then Lombardi worrying about the ‘la-la land’ atmosphere perhaps not being not conducive prep for a big football game like Superbowl I.
I do know Tom Landry of the Cowboys said he thought the Chiefs could play a good game vs GB & DALL and KC were considered somewhat similar, offensively. 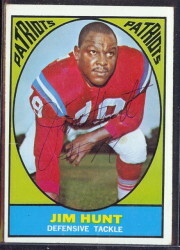 Too, former CLEV CB Bernie Parrish (who in ’66 played for the AFL Oilers and covered the Chiefs Otis Taylor) offered: “If the Packers think that they can cover Taylor with just one man there mistaken.” And, as it happened, Packers employed a ‘special’ defense of sorts in their coverage of Otis Taylor, who Herb Adderly said after was “the best WR I’ve ever faced”, according reports. 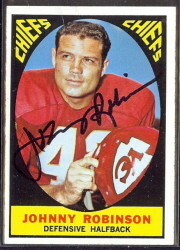 Too, old gum-beater Fred Williamson reportedly told his Head Coach Stram the Chiefs should have been throwing more short passes/outs to Taylor rather than slant ins, because “Adderly was afraid of Otis & playing 10 yards off of him”, but “they never threw the (short) hitches”. The Chiefs didn’t heed ‘The Hammer’s advice that day, but three years later vs the Vikings SB IV, KC did do what Williamson suggested. Otis took one of those short near sideline tosses & left Earsell Mackbee in his wake – ‘the clinching KC touchdown’ as it happened. GB won Superbowl I, but it may have just as much been fate in that GB was KC’s opponent, because I truly believe the Chiefs would’ve given any other NFL team a real run for the money, DAL, BALT, LA, you name the team. Even NFL, a matter “there’s GB, and then there’s everybody else”, with apologies to the then up & coming YOUNG Cowboys (who also stumbled along for another five years till 1971 before they managed overcome their rep as but ‘chokers’ & ‘tomorrow’s champs’. Great conversation and memories, all. That “comment” by Jerry Kramer doesn’t seem indicative of the type of guy he seems to be. 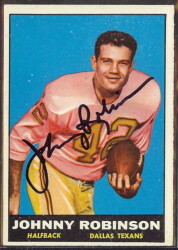 Reading his books, I don’t get the sense that he would take a low blow shot at a classy player like Jerry Mays. I would like to believe you’re correct Howard but for the record it was in a magazine with quotation marks, so, never having seen it refuted or challenged before… to each their own, conclusion drawn. One other thing re: Kramer; the guy belongs in the Hall of Fame my humble opinion. Having said that, it’s always bothered me a bit that he seemed to (my opinion) denigrate if even slightly C Ken Bowman’s assist/block in the 1967 Ice Bowl Game. It’s clear Kramer jumped the snap count slightly (could’ve been a penalty if noticed) but my personal take is that Jerry Kramer evidenced a little bit too much ‘smug’ affect re: his role said, at the expense of Bowman, in an interview I watched many years ago. I’m not a Packer fan & maybe I’m wrong to feel so, but it left me a bit disappointed in #64’s humility, my two cents. 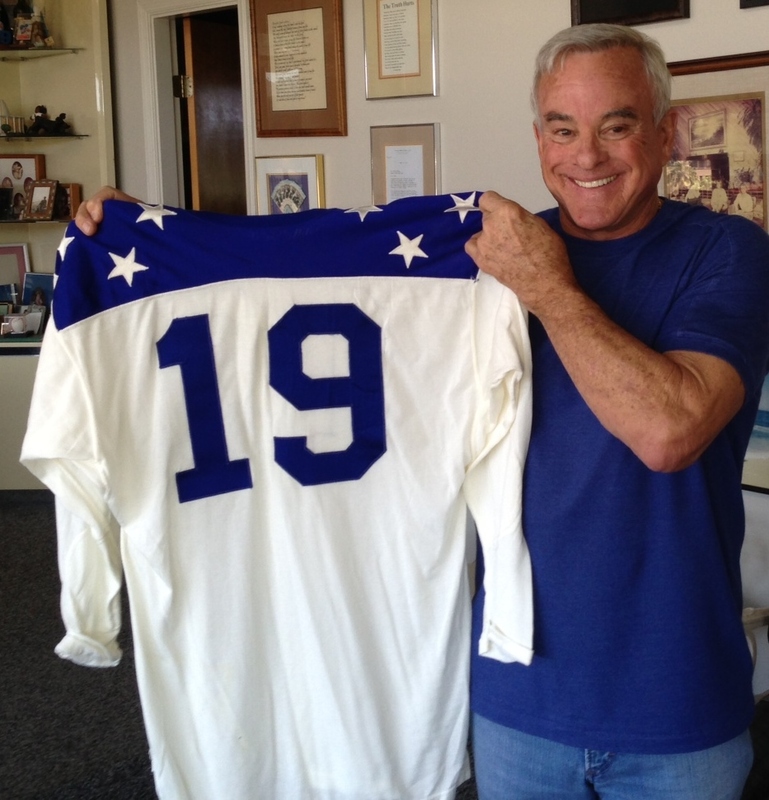 Bowman established a successful law practice after football, and he loved his final season of football, when he played for Hawaii of the notorious World Football League in 1975. Wow, there’s some lively debate going on here. I don’t know if I can add anything to it, but I’d still like to comment. I first read about the game in the late ’70’s. I looked at the box score, and to a kid like me, 35-10 came across as a flat-out rout. But here’s what else I remember reading, in 1977 or ’78. I was only 10, but I recall clearly the attitude of each coach at halftime. The Packers were up only 14-10, and Stram told his players, “We can win it.” At age 10, I thought, “Was he joking?” Now, having learned more about the game over the years, I can see why Stram was optimistic. Lombardi, on the other hand, chewed his players out. I remember reading that he was very upset. There’s no question the Packers dominated the second half. The Packers were more poised and experienced than the Chiefs were, and they responded to Lombardi’s half-time tongue-lashing. Certainly, it was no 50-0 game, and I believe there’s more to Super Bowl I than the notion that the Packers just totally blasted the Chiefs. Having said all that, I’d like to quote Howard: “The Lombardi Packers were a team for the ages.” I do think the Packers proved themselves to the best team of 1966. With another win a year later, they established themselves as the best team of the 1960’s–and perhaps the best team of all time.